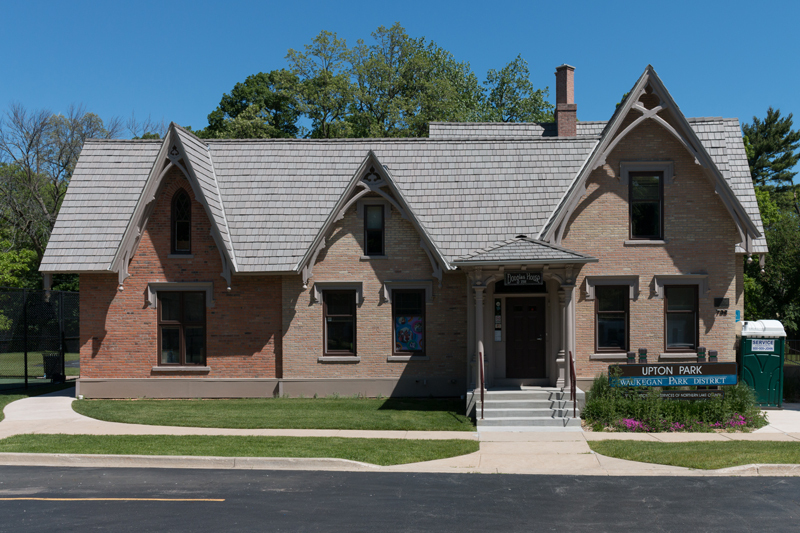 Built in 1853, the Douglas House in Waukegan, Illinois has a great history. Robert Douglas came to Waukegan from England in 1844. He traveled to California and made his fortune in a gold strike and then returned to Illinois to build his dream home. The house closely resembles a Gothic cottage that Douglas had loved in England. With its steeply-pitched roofs, wall dormers, hooded window molds and gingerbread bargeboards along the eaves, the home perfectly ties in with the Gothic Revival style. Fast forward through the years and the home was purchased and donated by the Upton family to the Waukegan Park District. It now houses offices and space where recreation programs are held for special needs individuals. In its 169-year history, the Douglas House has gone through several roofs. Most recently, in 1998, wood shake shingles were added to the structure to preserve the historic look. As cedar roofing is prone to do, the individual cedar shake tiles deteriorated badly over the years. The rotting, insect-infested shakes suffered from nails failing and wood shakes cupping and falling off the roof. This year the city decided to invest in a new composite shake roof. After receiving a recommendation from Legat Architects, it was decided that a low-maintenance DaVinci Roofscapes Multi-Width Shake roof in Weathered Gray would preserve the historic shake look while being a smart long-term investment. "The appearance and projected durability made it an easy choice for us to select DaVinci products," says Lali Salinas, parks department support aide in the Waukegan Park District. "On this historic building the DaVinci product offers the look of cedar shake shingles, but will give a greater lifespan and lower long term maintenance cost." For more historical roofing projects using DaVinci composite slate and synthetic shake roofing products, see History Repeats Itself — With DaVinci Composite Roofing.